Provenance: With the artist's family until 2002. These abstracts form part of a series of small sketches made during World War II as preparation for larger works (materials being in short supply), which Stephenson then executed in the 1950s. They were stimulated by the devastation resulting from the bombing of London (also recorded figuratively by Stephenson during this period). 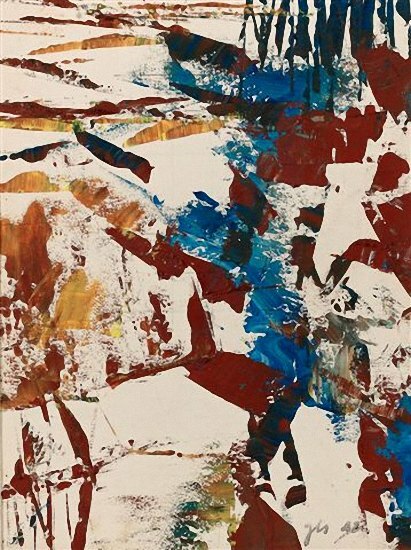 Stephenson made his first abstract paintings around 1932. In 1934 he exhibited with the 7 & 5 Society, along with Ben and Winifred Nicholson, Ivon Hitchens, Henry Moore, Barbara Hepworth and John Piper. Though not today as well known as many of his contemporaries he was one of the key figures in the development of abstract art in Britain in the mid twentieth century.